National Threatened Species Day is on the 7th of September 2016. It will commemorate the 80th anniversary of the death of the last known thylacine. This book is a collector’s edition; published as a keepsake of this commemoration. 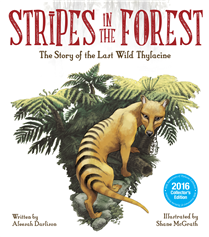 A powerful and emotive first person narrative is presented by the last thylacine. The text is accompanied by striking illustrations that depict with precision the early Australian landscape, bush forests, and wildlife. Bold text in large font strengthens each word, and calls attention to the significance of its role on the page. The story recalls the life and former freedom of this iconic species. It speaks of the dangers the female thylacine faced; her fears and struggles, and the courage needed for survival. The feelings of loss and grief are felt by the reader when she mentions losing a mate. The love for family and preservation is displayed in every word. Reading the text, the warm words expressed by the thylacine could easily have been spoken by a human mother; both being protectors of their children and family circle. Through a gentle and reflective tone, and illustrations that stand in place of a thousand words, a strong environmental awareness is created. Schools and libraries, overseas visitors, and readers with an interest of any kind in endangered species, will long to own this book for their collection. Teacher’s notes are available. Aleesah Darlison is a winner of the Environmental Award for Children’s Literature.